But another fire may well stop the future. 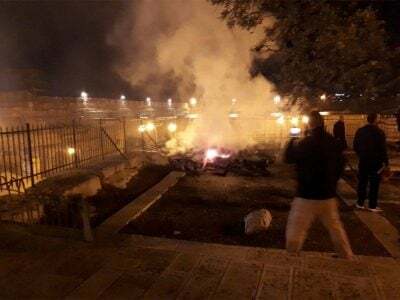 Concurrent with the fire that ravaged Notre Dame, another historical place of worship, the al Aqsa mosque in Jerusalem fell victim to a fire of an unknown origin. The Mosque which was completed in 705 CE, is the third holiest site in Islam. But its fate is not shared by Moslems alone – it touches us all. The world can be forgiven for their ignorance of this tragedy – and the importance of al Aqsa. The media simply dismissed it, as it does with all things that must be kept from the general public. This is not the first fire that was left unmentioned by mainstream media (MSM). A previous fire set to the Mosque by a zealous Australian Christian in 1969 failed to capture headlines. Indeed, the threats to al Aqsa Mosque have accelerated over the years to a point of no return. Given that the fate of this Mosque holds the fate of us all, how can the media be forgiven for their deafening silence? It took four years to complete the work on Hurva. When presidential candidate, Barack Obama promised AIPAC an undivided Jerusalem in 2008, the building of the Hurva synagogue was well on the way – which signaled continued future attacks on the al-Aqsa Mosque to make way for construction of the Third Temple. “Now, I don’t know about you, but when I heard about Jerusalem — where the King of Kings where our soon coming King is coming back to Jerusalem, it is because President Trump declared Jerusalem to be capital of Israel”. And how do we ignore Benjamin Netanyahu taking ownership of Jerusalem stating that the Bible, the holy book for Jews and Christians, had justified it. Should we then be surprised that rabbis sent a letter of gratitude to Trump, praising him for “fulfilling prophecies”. Some may take comfort in the fact that this is all sheer madness, but one cannot ignore the insanity of which we were warned of by Warner D. Farr, LTC, U.S. Army who in 1999 reported his findings in the “Counterproliferation papers, Future Warfare Series No. 2, USAF Counterproliferation Center”. This fascinating report, among other things, sounded the alarm over the probability of Gush Emunim, a right- wing religious organization, or others, hijacking a nuclear device to “liberate” the Temple Mount for the building of the third temple. This is powerful insanity with insane powers enabling it.